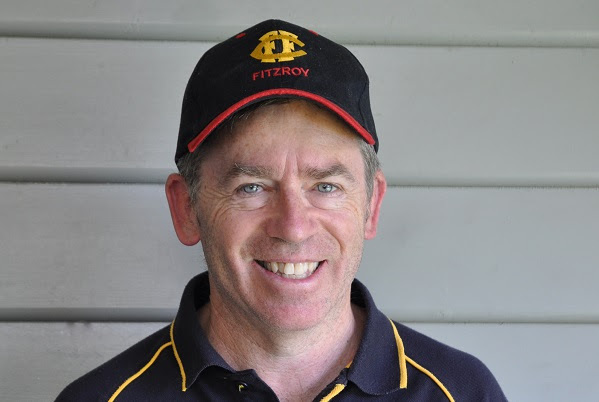 Fitzroy is keeping it all in the family with the appointment of Mick Symons to the role of Senior Women’s Coach, to lead the Fitzroy-ACU team into its first season with the VAFA. Mick, who played for Box Hill under 19s in the VFA and for Surrey Hills, is also the father of Will Symons, who burst onto the Fitzroy senior scene last year with some eye-catching games, up from the very successful Under 19s side. Mick has coaching experience in soccer and cricket and assisted with premiership winning Colts teams with the Fitzroy Junior Football Club. “I bring a strong focus on skill development and want to play a part in helping to build the Roys’ presence in the fast growing women’s competition,” Mick said. Mick played his junior football at Surrey Hills in the Eastern District Football League, captaining its Under 18s team and also earning a senior call up whilst still in the Under 18s. At Surrey Hills he played alongside Michael Coates, a Fitzroy winger from the 1980s. He went on to play in the Box Hill Under 19s in the VFA until he had to retire early after repeated head injuries and concussion. Mick’s move to soccer for Melbourne University saw him represent the university at five inter-varsity tournaments. He also played district cricket for Melbourne University through the 1980s. Mick has coached Alphington junior soccer teams for several years, and Edinburgh Cricket Club junior cricket teams for six years. In 2016 he assisted Tim Bell with the Under 19s in a number of voluntary roles. Mick will work closely with Jo Hogan, who has been doing an incredible job overseeing the pre-season schedule for the Fitzroy women’s squad and will continue in the Women 2 coaching role. The exciting news from the VAFA in relation to the Fitzroy-ACU Women 1 team is that they will play in the Premier division in the first year of their women’s competition, along with the other existing VWFL teams who are coming across to the VAFA - the first three rounds of Premier will see Fitzroy-ACU, AJAX, SKOB Saints and Brunswick Renegades play each other, starting on 8 April. After round three, the top four teams from the other six divisions will be elevated to Premier and the remaining 32 teams (including the Fitzroy-ACU Women 2 team) will be divided into four divisions of eight teams based on region. The draw will be developed after Round 3. We’ll bring you more news as we have it. It is expected our women’s teams will play on a Saturday this year. hank you to everyone who has purchased or renewed their membership for 2017. 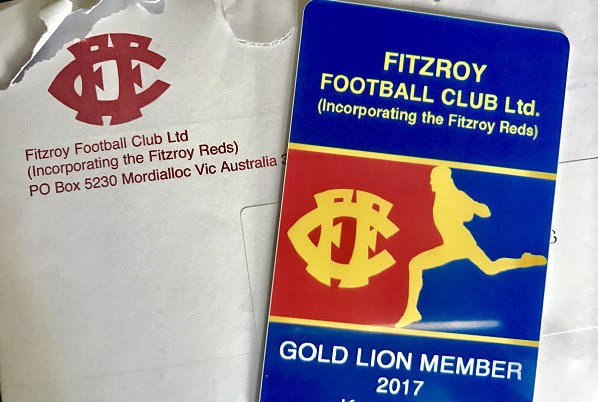 Remember if you purchase your membership by COB 28 February, you will go in the running for a new Fitzroy jumper, which will be drawn by senior coach Nick Mitchell at the season launch on 1 April. In the meantime, the membership month of February was off to a big start as people were keen to get their hands on the Fitzroy training singlets awarded to the first 10 purchasers of online memberships on 1 February. It was only mid morning on the first day when we had our first 10 names! Congratulations to Danny White, Andrew White, Sam Warren, John Neale, Richard Poole, Chris Bell, Matt Owens, William Westerman, Bill Shannon and Peter Wells, who are now all the proud owners of Fitzroy training singlets. Thank you for your enthusiasm! So far our Fitzroy memberships have been ordered from all over Australia and even overseas. From Brunswick St North Fitzroy, right across Victoria to Moama NSW, Bunbury WA, Kambah in the ACT, Cygnet in Tassie, Mount Gambier in SA, quite a few from Brisbane, Otago NZ and even Staffordshire in the U.K! Thanks to all of you and keep them coming. For many long-time Fitzroy fans, membership renewal is a time of reminiscing and this week Bill Atherton at the Fitzroy shop received a letter and membership renewal from 90 year old Graham Keil from Bairnsdale, who was reminiscing about his first trip to Brunswick Street Oval to see the Roy boys in 1933 when he was just six years old! He was lucky enough to see Haydn Bunton and ‘Chicken’ Smallhorn in action – not one, but two Brownlow Medallists running around that day! Graham shared his good wishes for the season and continued support for what the club does for young people. Expect to see quite a new-look and youthful Fitzroy senior side when the season rolls around, with a number of new faces on the track and at the pre-season camp. There were over 70 players at Portsea, with 34 women and a strong contingent of Under 19s graduates getting involved. Senior Coach Nick Mitchell says one of the great benefits was some “awesome team bonding” and also noted that there are bigger numbers on the training track than at this time last year. Nick said he was really pleased to welcome back Max Ellis (an elite backman) who returns after a year overseas, Nathan Jumeau, a former Fitzroy Under 19s player who is a good moving, half-forward/wing player and Mitch Bottomley, who is coming across from McLeod. Nick is also looking forward to seeing what the Under 19 graduates can produce this season. Several young players, such as last year’s best and fairest winner Aiden Lambert, Will Symons, Isaac Wattis, Jacob Long and Aiden Burke, who all have senior games under their belt, are training strongly and expected to play a lot of senior football this year. The other great news is the fitness of Will Pickering, who seems to have overcome persistent injury concerns and is working with Fitzroy sponsor, Das Pilates, to keep him on the track. Nick has also welcomed a former OId Geelong colleague and most recently Barwon Heads player, Archie Whiting, who has been appointed as a line and development coach, bringing a strong footy brain, good communication and recent playing experience. The development role is likely to be an important one as several of Fitzroy’s seasoned senior players will not (or are unlikely to) play this year through a combination of work and study commitments and travel. They include co-captain Daniel Bisetto, Tom Biscaro, Matt Brown, Al Green, Greg Hesse and Dom Pound-Palmieri. 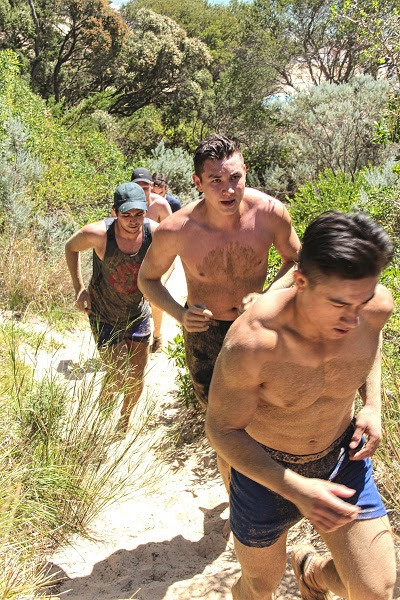 Of the camp, Nick said it had delivered a spike in fitness as everyone had to work pretty hard and took on a range of physical and psychological challenges. We also asked for a number of other perspectives on the camp. 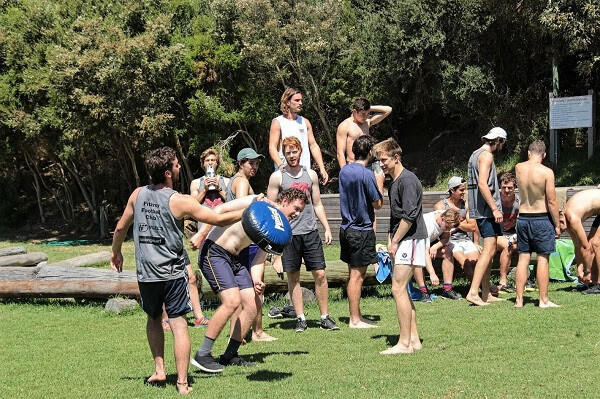 First timer to the camp and one of the large contingent of Under 19 players vying for senior selection, former Fitzroy junior Ben McDonald, gave us his thoughts on his first experience at Portsea. Fitzroy President, Joan Eddy, who also attended for the weekend, echoed the views of the senior coach saying it was a great club and team bonding experience. “Nick did a great job, with a strong presentation on game day strategy. Joan also mentioned the volunteers and thanked Kerry Winchester, Mandy Hudson and Phyllis Quealy, who attended to prepare the meals and make sure everything ran smoothly. Fitzroy-ACU’s Georgie Steggall said the women’s team are hungry for respect and their performance at the pre-season camp proves it. “Jo Hogan made it clear that camp was the line in the sand moment; that it was time for the girls to commit to the team and to work hard in order to bring Fitzroy-ACU to the grand final again in 2017. “We wanted to stand up and be counted against the boys’ teams. With this in mind the girls hit the track for a mid-morning skills sessions. Kicking drills dominated the session, the girls working hard on hitting targets on a lead as well as perfecting their stationary kicking technique. This was followed by a tackling session in the sand, led by Alexa Madden. 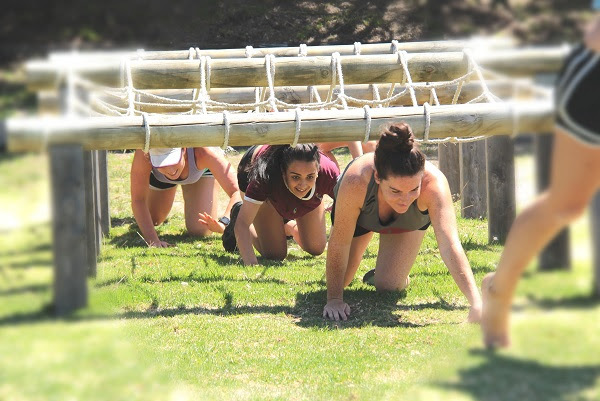 “In the afternoon the girls were faced with their biggest challenge yet in the form of an obstacle course (Hurl’s House of Pain), designed to challenge them mentally and physically. Divided into two teams we set off with enthusiasm. During the gruelling experience the girls made sure to work as a team, with no individual outperforming the whole. “On the 10th and final lap, the two women’s’ teams combined to finish off the course as one. Despite the physically exhausting experience the girls summoned enough energy to finish off with a big cheer and a group dance,” Georgie said. 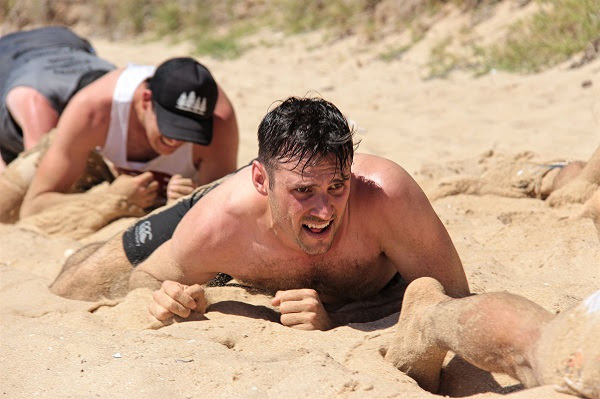 All the photos from the pre-season camp at Portsea are now up on our club Gallery thanks to Phyllis Quealy. You can see them here. Several pre-season games are planned, so if you want to see some of the early season form, pop some of these dates in your diary. Saturday 1 April – Fitzroy vs Monash Blues at Brunswick Street Oval and Ramsden Street Oval - includes Women and U19 matches. The other big date is the season launch on 1 April at the Fitzroy Victoria Bowling and Sports Club starting at 5pm, after the games against the Blues wrap up at Brunswick Street and Ramsden Street. Practice matches for our Women's teams are currently being planned. Keep an eye on Fitzroy’s website and social media channels for more details. As with all community football clubs, Fitzroy has a big need for volunteers to help the club run; everything from game-day activities such as goal umpiring, scoring, statistics to live score updates on social media, web content updates, merchandise sales, assisting with pre-game lunches and raffles and more. 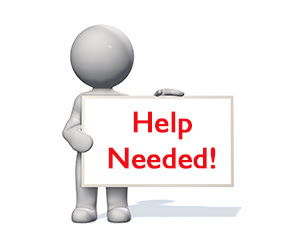 If you are keen to get involved, make sure you let us know! The Fitzroy-ACU women’s squad has been incredibly lucky to have had a number of guest coaches attend their preseason training sessions. Last week Ben ‘Speckie’ McGee from the Simon Black Australian Rules Academy took the girls for their Wednesday evening session. Speckie reinforced the importance of perfecting basic skills such as kicking, hand-balling and contesting the ball. The girls moved into a one handed kicking drill which, involved placing one hand behind their back, and dropping the ball onto their foot from the other free hand. Speckie suggested that perhaps one or two girls would be able to produce a perfect backward spinning ball to a target from the one handed kick. The girls quickly proceeded to prove him wrong, and within seconds Speckie was enthusing about the kicking skills of many of the Roy Girls. Speckie’s instruction was fast paced, and the girls were quickly moving from drill to drill, experiencing a ‘crafting session,’ a key feature of the Simon Black Australian Rules Academy training, where players work on fine-tuning their skills. The opportunity to learn from the Academy was greatly appreciated by all who attended. The girls who have never played footy before found the session particularly rewarded with some achieving their best kicks and handballs yet! The women’s squad has also had the benefit of a training session from former three-time Premiership coach at the Darebin Falcons, Richard Dal Pos. He will be back again for more work on skills. 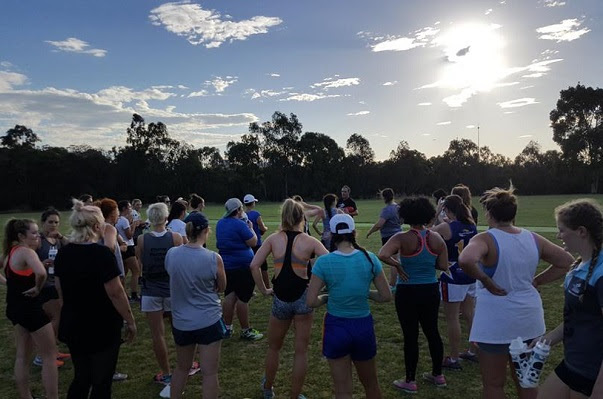 Pre-season has seen a group of 34 women regularly attending, with numbers increasing recently, while many more have expressed interest in playing for Fitzroy in 2017. The appointment this week of Mick Symons as senior coach is hoped to encourage further development of the women’s squad over pre-season. In a great sign for our future, the demand for Under 19s spots has meant Fitzroy will need to field two teams in 2017. Tim Bell is often considered the master coach with his outstanding results at Under 19 level, and this season he’ll have more players at his disposal. He will also need a new partner in crime and Fitzroy will soon advertise for a second Under 19s coach. The Fitzroy Board this week approved the creation of the second Fitzroy Under 19s team. The development is seen as an important pathway from the Fitzroy Junior Football Club. The second team, U19 (2) will play in a different division but it isn't known which one yet.